1. Cut the top off the watermelon and scoop out the flesh. Remove the seeds and blitz the flesh. 2. Add the rum, lime juice and splash of coconut water. Stir, then serve with ice and a lime garnish. To make it a mocktail, replace the rum with 150ml coconut water. 3. 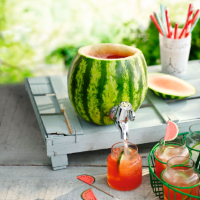 For a bit of extra theatre, serve it in the melon. We unscrewed the tap from a Kilner drinks dispenser and fitted it to the melon.